The two groups expect that every one of the 40 seats in the hearing room will be filled and in fact have asked the vendor helping with setup to bring folding chairs – but you may still reserve a seat at the event HERE. Those who do RSVP have priority seating, and the Congressional staff requires us to provide them in advance the list of attendees. There are plenty of seats still available for the evening conference. Some of those who attend the day activity with Congressmen will be invited to share their experience at the evening conference and Rally. 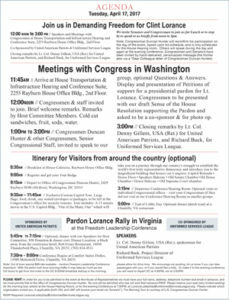 Details – including the optional 8:30 AM breakfast and capitol hill tour under the auspices of Congressman Duncan Hunter, are spelled out on the “Restore Freedom Day” flyer (2 sides, 8 ½ by 11) HERE. Speakers for the April 17 “Restore Freedom” Day. 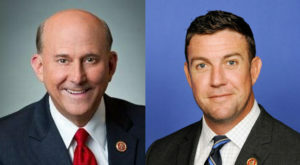 Congressman Louie Gohmert has joined his colleague Duncan Hunter to speak to the group at the House Rayburn Bldg., while the others shown here will speak at both the day evens and the evening’s conference and rally. The following activities are open to supporters of United American Patriots and Uniformed Services League – and both organizations have notified them of the Tuesday event – but there are still some seats open and there is no limit (so far) for the evening event in northern Virginia. 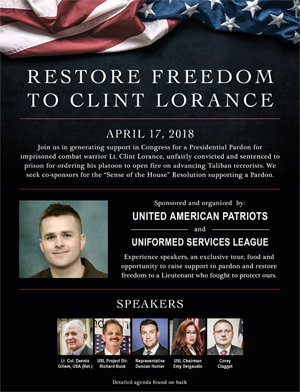 Here are the activities scheduled for “Restore Freedom Day” for Clint Lorance – which the event organizers say is the first in a series of RESTORE FREEDOM events for Lorance and other U.S. servicemen who have been unfairly targeted for doing their duty. 6 AM. Meet at Comfort Suites Dulles if you want a bus ride (is your name on the confirmed list?). No charge. Comfort Suites Dulles Hotel, 13980 Metrotech Dr., Chantilly VA 20151. (703) 263-2007. 8:30 AM. `Breakfast at House Rayburn Bldg. Cafeteria (ground floor, dutch treat). Only those who have sent in a RESERVATION which has been confirmed, will then be given their CREDENTIALS (a badge) to allow them to join in the rest of the day’s activities. 11:30 am. Return to Rep. Hunter office to retrieve your belongings. 11:45 am. Arrive House Transportation & Infrastructure Hearing Room, Suite 2253, Rayburn House Office Bldg.. Lunch 12 noon to 1 PM, Members of Senate and House of Representatives & senior staff invited for lunch and for briefings until 3 pm. 1 to 3 PM. Briefings for Representatives & Senators (and/or senior staff) who attend, plus they will address our group about our concerns, and some will accept Questions & Answers and pose for photos with our group. 3 PM. Those who can do so, to visit your own Congressman’s office with our briefing packet and ask the Congessman to speak out for Clint Lorance and those in a similar situation to him, and ask if they will sponsor the proposed “Sense of the House” resolution supporting a Presidential Pardon for Clint Lorance. 3 PM. Those who will join in the evening activities should depart Capitol Hill to go to Chantilly, VA.
6 PM. Dinner with the Speakers & Conference Leadership at Bob Evans Family Restaurant, 14050 Thunderbolt Place, Chantilly, VA 20152 (703) 834-0511. Near intersection of Rt. 28 and just off Rt. 50, several blocks away from the conference & H.Q. hotel. This dinner is ONLY for (a) $50 Host Committee members (your donation of $50 or more enables us to pay for the day’s activities – pay to Freedom Leadership Conference, Uniformed Services League or to United American Patriots). The Host Committee donation is waived for anyone who spent the day on Capitol Hill with the group. 7 :30 to 9 PM. “Restore Freedom” Conference at Freedom Leadership Conference at Comfort Suites Dulles Hotel, 13980 Metrotech Dr., Chantilly VA 20151. (703) 263-2007. Speakers include Lt. Col. Denny Gillem for United American Patriots and Richard Buck for Uniformed Services League. Members of the family of Clint Lorance and his attorney may also be in attendance. Several of those who attend the day-long activities will be selected to speak about their busy day and the impression they got from the Congressmen who attended and spoke. Important note: there is a $99 rate for those coming to the “Restore Freedom” events during the day and the evening conference (discounted from the normal $119 to $159 rate), which expires on Sunday nite at 5 PM. There are a limited number of these rooms being held. Once they are booked the regular rates then apply. Click HERE to make use of that rate or call and ask, (703) 263-2007 (mention: Freedom Leadership Conference). This special rate is available only for Monday and Tuesday nites (April 16 and 17, checkout on Wed. 4/18). The Freedom Leadership Conference requires an RSVP advance Reservation for admission and $5 admission at the door, write RSVP@FreedomLeadershipConference and provide your name and zip code. The daytime activity requires both an advance RSVP reservation and also a confirmation response from us. There is a limit of 40 seats in the House Hearing Room from 12 noon to 3 PM. We are providing lunch (to repeat: only for those with a confirmed, advance reservation). There is no admission for those who just show up without having their advance confirmation. The Congress has strict requirements for us to provide them a list of who is attending in the hearing room (name, address, phone, email). We sincerely regret the disappointment some are going to face because they did not read this or did not follow this requirement, but those who did, will have first priority seating at the House of Representatives, Rayburn Office Building. There are separate activities going on all day, and for you to attend any one or all of them, you must make a very specific and firm commitment that you wish to attend, which event you wish to attend, and you must send your reservation notice, and have a confirmation response. If your name is not on the confirmed admission list, then we need to wait until all others who are on the list are first admitted, and then, if there are any opens seats remaining, we will give them out according to the old rule “first come, first served.” You may reserve any of this at RSVP@FreedomLeadershipConference.org. In summary, the day’s activities begin at 6 AM at the Comfort Suites Hotel in Chantilly, and end at the same location. You are invited to participate at any one or all of them. We require a very specific, firm commitment AND A RESPONSE CONFIRMATION for you to be admitted to any of the day activities including the dinner (for Host Committee $50 donors & those who attended the day activities only). A reservation” (only) is required for admission to the “Restore Freedom” Rally at the Freedom Leadership Conference (with a $5 admission donation at the door).